Another commissioned piece. I was asked to do an Illustration of A character just referred to as "RED". I hadn't taken the time to find out her actual name but scanning through the ref I was given I found a few things about her. I think she may be called Red Sonja. If that is her name I can understand just going by the nick name. The other is that apparently she is like Samson. I don't know the total ins an outs of it but she has some spell placed on her where she has to keep her chest bare at all time. I don't know if like samson this is the source of her strength or some bizarre curse. I was asked to do a commission from someone who had seen my art and I was turned on to a rarity in anime. 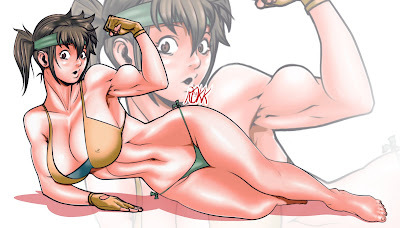 Its been called Manga Muscle girls. Or at least that was the way It was referred to. I like the blend of the typical overly cutesy anime damsels with the stern physic of body builders. Of course, some of these girls run the gambit from well toned to down right buff. So much so that there are some that would dwarf your standard comic action hero. I had a guy ask me if I would redraw one of his characters and I agreed. To bad I started getting more Illustration work and had to put it on hold for about a week. Still, it was a fun project though.